Tonight's a slow and heavy doom kinda night. 83 minutes of slow and heavy doom to be exact. I've finally managed to find both the time and the mental space to be able to sit and listen to a release that was widely talked about towards the end of last year. The Seattle duo Bell Witch released "Mirror Reaper" on double LP, CD and digitally last year via Profound Lore, making it their third full-length since their inception in 2010. They received a lot of plaudits via the heavy music press in the race to get end-of-year-lists out and while I'm a little late with this, I'm also excited to finally be able to soak it in. As far as casual reviewing goes, this is a new experience for me. I’m used to reviewing albums of this length that are made up of multiple songs. That being said, I appreciate when bands do different things. There’s no forced or brash build-ups on Mirror Reaper. The opening two-and-a-half minutes are soothing with just the sounds of one guitar and it’s melody. It’s a shock then when Bell Witch’s doom finally kicks in thereafter, as it crawls along with dissonance and a minimalist yet powerful percussive element. The addition of the low (nearly whispered) growls remind you of the band’s extreme persuasion, while the almost shamanistic drone of both the clean vocals and the instrumentation are trance inducing. One thing that the duo does really well is weave some incredibly soaring guitar melodies into the music, which is made even more special by the fact that they’re produced by a bass, though bolstered by some equally impressive Hammond organ playing. 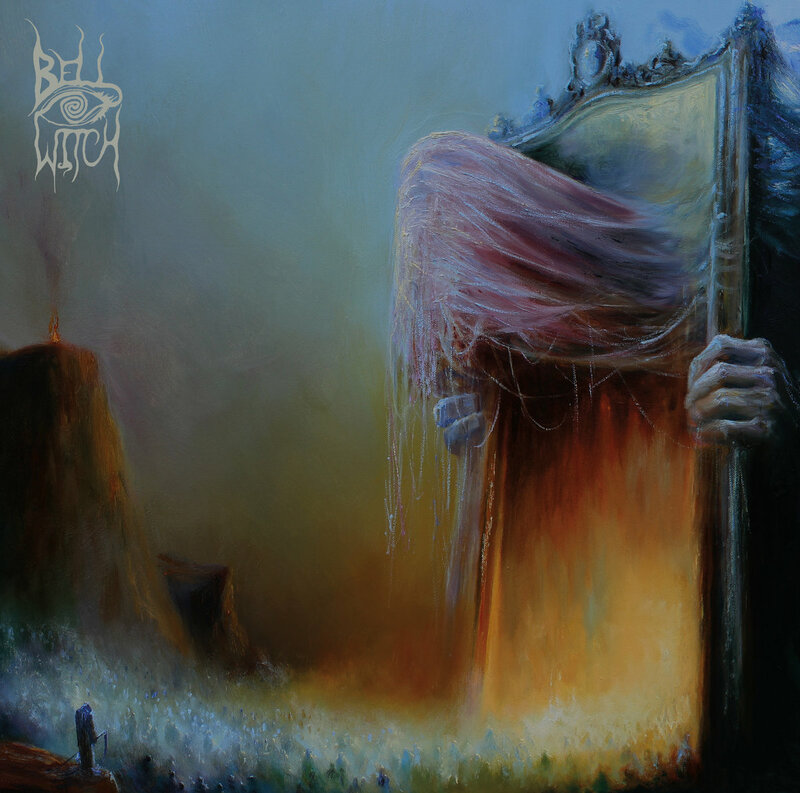 Bell Witch switches between both lighter and heavier sections on Mirror Reaper and it’s this sensitivity that endears you to it. The heaviness is not too in your face and is far outweighed by the melody during those lighter sections and there’s no need for prolonged periods of silence either. To be honest, I wasn’t really sure what to expect from this but at the 30 minute mark I’m in awe. It may be amongst it’s heaviest at this point, but even then there’s a stark beauty to the song. Funeral doom can be an extremely hard sub-genre to nail as a band and enjoy as a fan, but this has been done in a way that removes that claustrophobic feel and replaces it with something that’s more akin to post-metal, but slower. I do feel silly trying to adequately describe a piece of music that’s been written about so many times already, but I guess on this occasion I’m doing for no other reason than for the pure enjoyment, because that’s what music is there for beyond any of the short-lived fads and fashions. It should be enjoyed for what it is and how it makes you feel. Mirror Reaper’s light/dark passages come and go like subtle waves. The quieter moments accentuate the louder ones and visa versa. The additional vocals performed by Erik Moggridge are hauntingly good while the production/engineering/mixing (by Billy Anderson and Bell Witch), the recording (done at Hallowed Halls) and the mastering (by Justin Weis) allow the entire piece to be clear and very organic. The music is also matched by the incredibly artwork (of Mariusz Lewandowski). It must look great in double LP form, which reminds me that I need to try and pick up a copy. It’s an emotive feeling as Mirror Reaper comes to an eventual close. There’s a lot to it, even in it’s simplicity. There’s no pretentious song-structure or arty-musicianship, just good honest doom that’s got it’s own personality. Bell Witch has seemingly raised their own musical bar here and it’ll be interesting to see if they can reach or even beat it with their next offering. Hundred Year Old Man - Rei 12"